In Hear This, A.V. Club writers sing the praises of songs they know well. This week: For Pets Week, songs written about or inspired by pets. Paul McCartney has written a lot of sentimental and sappy songs. Hell, he’s even written a song defending all those sentimental, sappy songs. 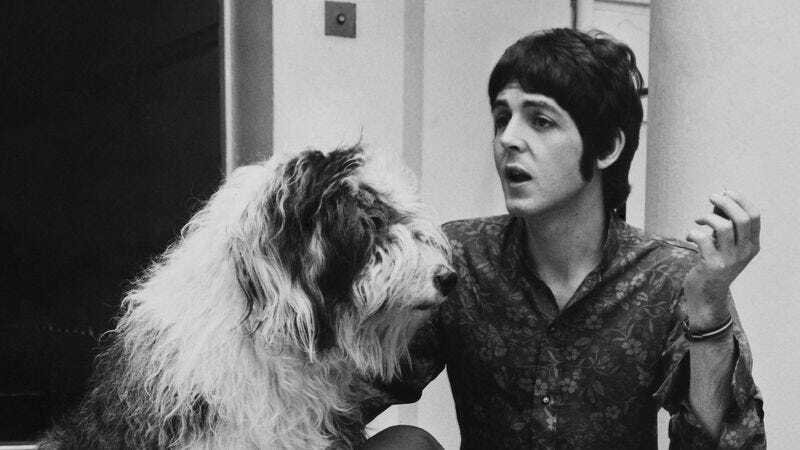 But it’s hard to beat the sentimentality behind a song like “Martha My Dear,” which McCartney named for his big, fluffy Old English Sheepdog, Martha. Though McCartney has since admitted that the lyrics of the song are probably more about his ex, Jane Asher, than about his actual dog, it’s fun to pretend the whole thing’s about an adorable canine. When McCartney sings, “You have always been my inspiration,” for instance, he simply must mean he’s long been inspired by Martha’s constant companionship and loving eyes. And “hold your head up, you silly girl,” just has to be about a dog, right? Dogs are silly, and Jane Asher never really seemed to be all that big of a card. I’m especially partial to the phrase, “Take a good look around you / Take a good look you’re bound to see / That you and me were meant to be for each other.” As an obsessive dog owner myself with a gigantic, unwavering love for my own little French Bulldog, Harley, I just feel like—assuming McCartney’s singing about a dog here, and that’s a big assumption—I get him. When my husband and I rescued Harley, we knew he was meant for us from the second he came for his first placement visit. He sat right in our laps and didn’t want to leave. He fits with us, with our hearts. So while McCartney is probably singing about the massive amounts of love he felt for some gal, the whole track still works if he’s just singing about love for someone—or some thing—in general. I love Harley as much as, if not more than, McCartney probably loved Jane Asher, and so, hell, whatever he has said be damned. “Martha My Dear” is about a dog, and that’s it.